Eagle Baseboard for ARM COMs Diamond Systems’ EAGLE Diamond Systems’ family of compact SBCs is designed to support the Toradex Apalis i.MX6, T30 and TK1 ARM computer-on-modules (COMs). The product line is composed of two models: the full-size Eagle and the smaller Eaglet. Both models are fully-configured off-the-shelf solutions consisting of an I/O baseboard with an installed ARM module and heat sink. The Eagle/Eaglet products are also available with a fully configured Linux OS embedded into the ARM modules’ on-board flashdisk. 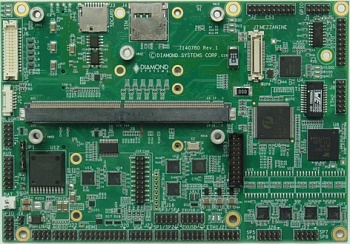 Development Kits, including the fully configured SBC, pre-configured Linux OS, and a full cable kit, are available from Diamond Systems. Visit the Toradex website for detailed information on the Apalis family of ARM modules used on Eagle and Eaglet. Eagle and Eaglet feature a wide variety of functionality. The smaller Eaglet provides the core functionality provided by the installed ARM module, while the larger Eaglet provides enhanced features for applications requiring more I/O.